Lime Oaks Riding Centre as located just outside the village of Hemingbrough, North Yorkshire. We offer private tuition, Pony Club camps, tuition for small groups, hacking, show jumping and tuition for both adults and children. With over 35 years experience Heather Talbot is a highly qualified instructor. Lime Oaks is licensed with Selby District Council and is fully insured. Heather Talbot is a BHS registered instructor, of Riding and Road Safety as a trainer and examiner. With over 35 years experience Heather has a Certificate of Education, the BHSI Intermediate Certificate and is an approved RDA instructor (Riding for the disabled). Heathers previous experience includes a lecturers post at Askham Bryan Collage and several posts as Stables Manager. 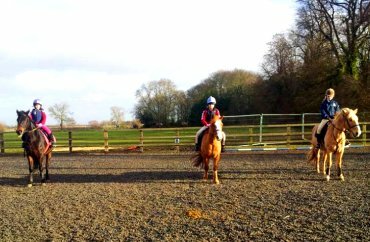 Lime Oaks Riding Centre is run and managed by Heather and is fully licensed and insured. You are assured of the highest standard to training regardless of the age of the student and a fun and enjoyable atmosphere. Lime Oaks is also a member of The Pony Club UK which promotes the education of young people through the provision of instruction and examination in riding, horse care and animal welfare. Learning to ride need not be a costly hobby, with lessons from as little as £12, we hope to make riding available to people of all ages within the local region.